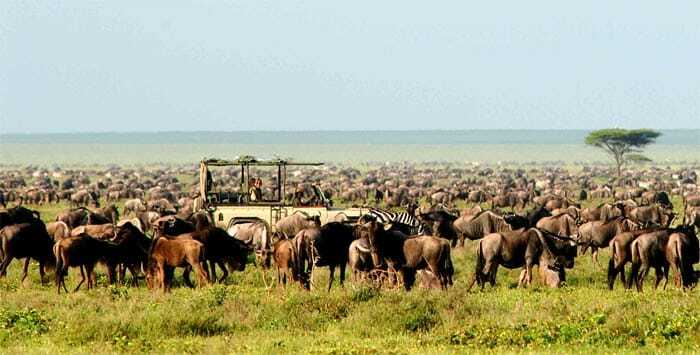 Witness the Tanzania migration: endless lines of wildebeest, calves born in staggering numbers, with attendant predators on the prowl… Visit the wildlife studded floor of the Ngorongoro Crater and sleep in a yurt tent! Walk the Highlands in the company of Maasai warriors. 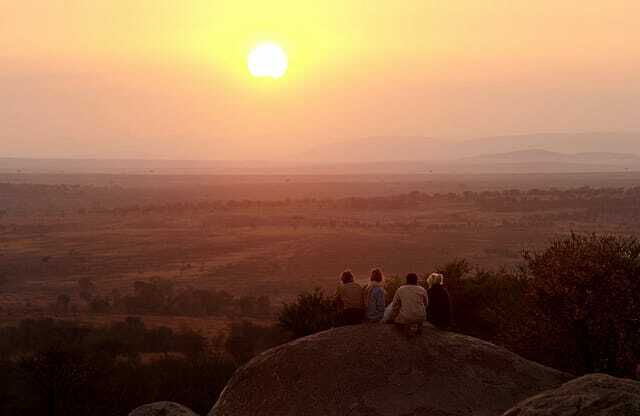 Picnic amongst the kopjes in Northern Serengeti and track a rhino through the bush. An Amarula-laced coffee around the campfire caps off the day. Are you looking for a top-notch Tanzania safari with a laser-like focus on wildlife? Then this one is for you! From the world-famous Ngorongoro crater to the Ngorongoro Highlands, from the wildebeest calving in the southern Serengeti plains to the remote north of the park, this safari combines the wildebeest migration in Tanzania with game drives, walking safaris with the Maasai, bush meals & night drives. The safari ends among the kopjes of the north where it is blissfully quiet and you get the feeling that this iconic park has been set aside just for you. After enjoying your first African sunset from Machweo House, you will meander through Lake Manyara NP before getting to the Ngorongoro Highlands for your descent the next day into the crater. Lake Manyara NP is the dispersal area for many hoofed animals at this time of the year and you stand a very good chance of seeing large dazzles of zebra and herds of gazelles, as well as good sized elephant herds here. From Gibb’s Farm, a working plantation on the slopes of the crater, you will descend the world-famous caldera, home to 25,000 animals. From there, you will visit some remote areas of the conservation area, staying at Nomad’s Nduara Loliondo and then move on to Ndutu and the southern plains where staggering numbers of antelopes gather to have their calves and are followed by their attendant predators. The safari will end in the far north of the Serengeti at Nomad’s Lamai Serengeti Camp. Perfect for: A calving period focus combined with remote areas of the National Park as well as the Ngorongoro Conservation Area, where luxury is defined as being far from the madding crowds. Wildlife: Lion, leopard, cheetah, elephant, Cape buffalo, rhino (if lucky), wildebeest, topi, impala, gazelles – altogether 70 large mammals and 500 bird species! When one of the largest animal migrations in the world crosses your door step for several months of the year, as it does at Lamai Serengeti between July and October, it’s sometimes easy to overlook what all of us who have spent so long in the Serengeti keep reminding ourselves. Lamai Serengeti by Nomad Tanzania is in the midst of true wilderness. Sit on a kopje and witness the spectacle of the Tanzania migration unfold before your eyes. It’s not all about the migration. To define the Serengeti purely in terms of the wildebeest timetable is to massively underestimate the variety of this part of Africa. To define the Serengeti purely in terms of the wildebeest timetable is to massively underestimate the variety of this part of Africa. Throughout the year, we use our 4×4 s to explore the variety of terrain, both south of the Mara River and (river state permitting) to the north and we’re able to offer short bush walks when the grass is low enough to make walking safe. The topography lends itself well to being on your feet; small valleys, river lines and rocky kopjes make for frequent changes of scenery…and great cover for approaching wild animals unseen. And of course with a location like this one, of the best ways to take in the Serengeti is literally from the expansive verandah of your room, tucked away in amongst the red rocks of the kopje. The rooms are designed to maximise the panoramic views, but also to give a window onto life on the kopje. In short, at Lamai, you can be as busy as you like with game drives and walks, or as lazy as you like enjoying the Serengeti from your room or the swimming pool. Picnic and drive and walk among the rocky kopjes of northern Serengeti in blissful peace. This area has staggering numbers of resident wildlife all year long! Peter Kerr, the GM of Gibb’s Farm, has personally extended a very warm welcome to Chalo Africa’s guests. When we got in touch with him about potentially collaborating with Gibb’s, we were delighted to learn that Peter had spent some considerable time with the hospitality industry in India, including at Ananda in the Himalayas. He has fond memories of his time there and would love to welcome our guests to the special retreat that is Gibb’s Farm. This Tanzania safari map indicates when the wildebeest migrate to different parts of the Serengeti (Tanzania) and the Masai Mara (Kenya). This incredible tour begins and ends in Arusha, Tanzania.